Other than a 10K on October 19th, I didn't have any exciting races during these past 3 weeks of training, but overall I felt like it was a good few weeks. 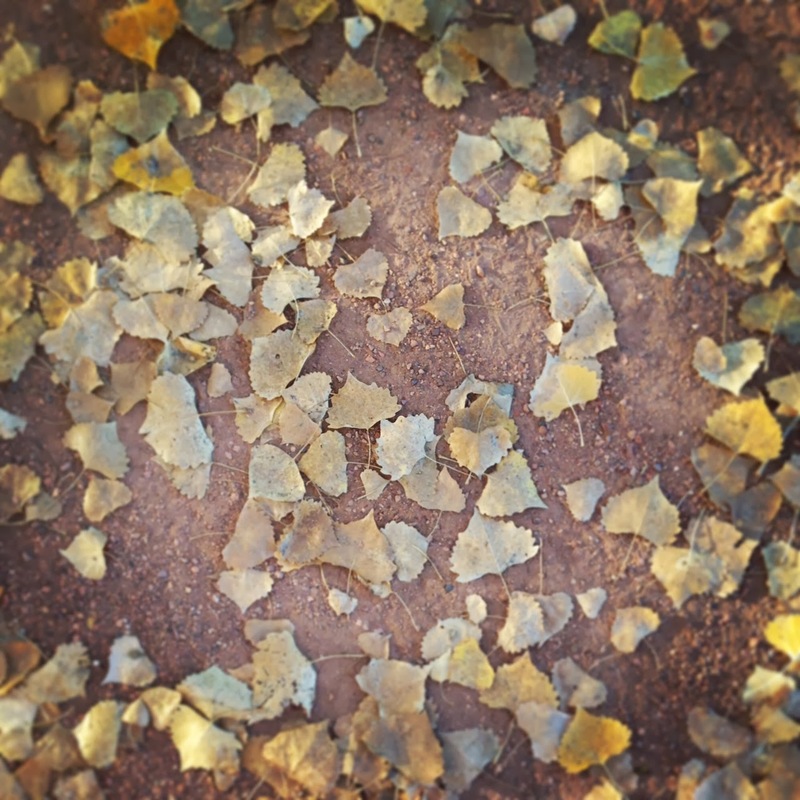 I think a lot of it has to do with how beautiful it is this time of year. Running on crunchy leaves always makes a run better! It was chilly out, but the sun was beating down on me so much, it was the perfect temperature! This was a "step back" week (every 3 weeks of training, is a "step back" week with lighter, shorter runs), so my "long run" was only 9 miles. 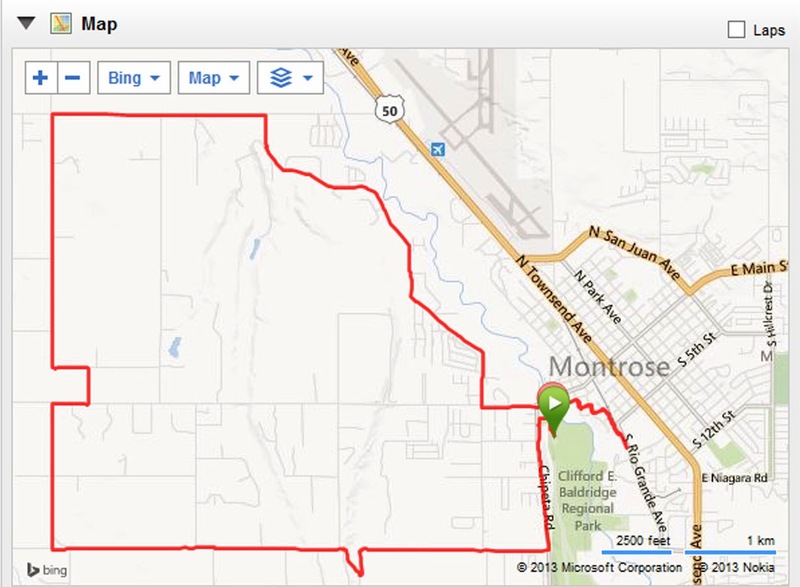 Scott and I just ran a loop starting from the house, along the east side of Montrose. 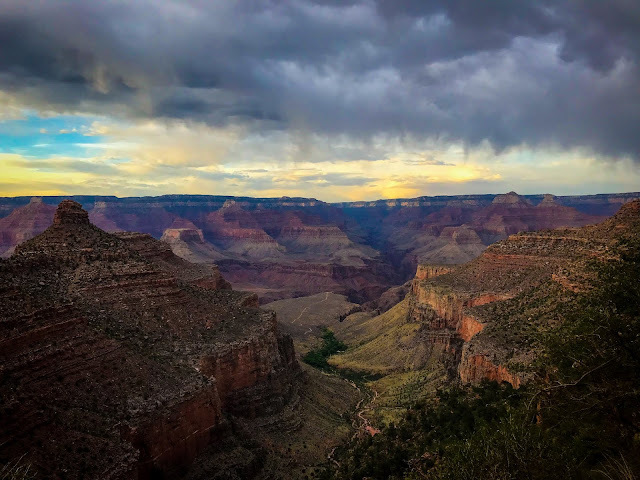 3.26 Miles – last “run club” of the season! Kicked off week 7 by walking up 150 floors! Did the Stairmaster as my "cross training" exercise. That was kind of fun. Other noteworthy moments would be another gorgeous run at Confluence Park on Wednesday (probably my last good evening fall run of the season due to daylight savings), and, on Thursday, rushing home from work to get to the Looney Bean "fun run" - a loop starting at Looney Bean Coffee in Montrose and heading over into Baldridge Park. I wanted to go one more time before it ended for the season. Is there a better running surface than this? I think not! At Confluence Park in Delta. 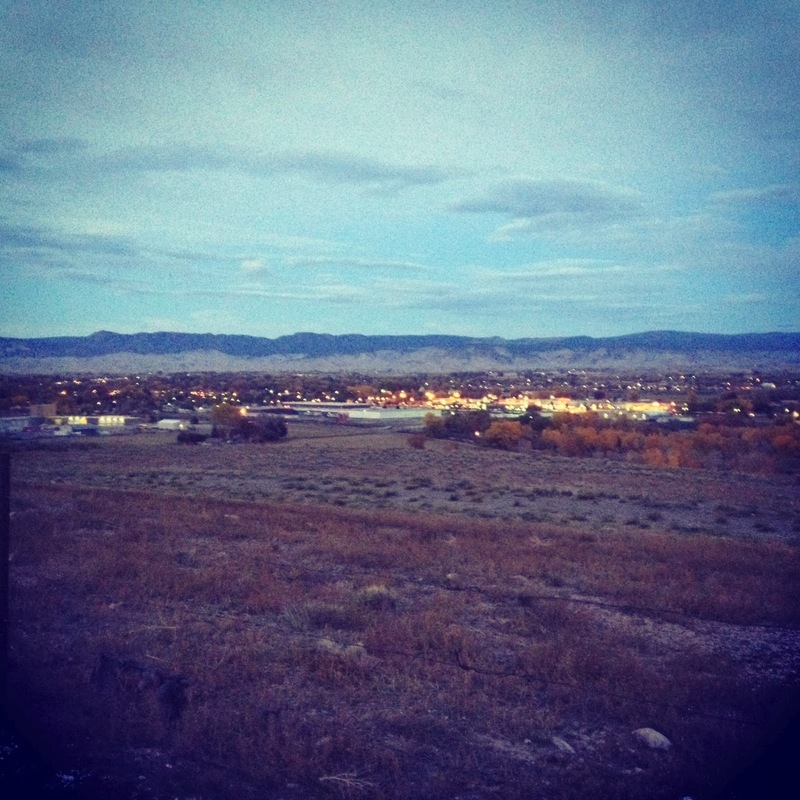 This is from the Looney Bean "fun run", on top of Sunset Mesa looking out towards Montrose as it got dark. The long run of the week was 14 miles. 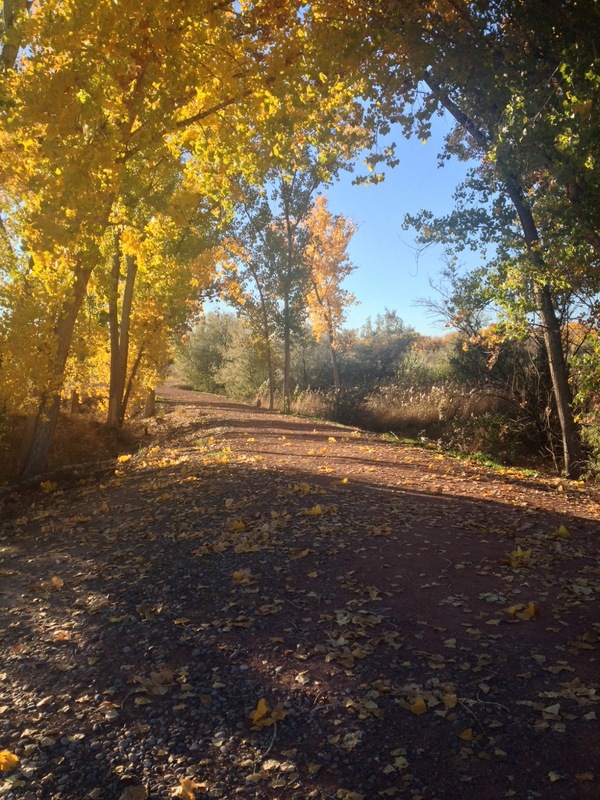 I was tired of trying to figure out how to get 14 miles in near our house, so I convinced Scott to go do an out-and-back along the Uncompahgre Riverway Trail (which turns into the frontage road heading south towards Ridgway). It was nice, although I'm a little concerned that over half of this route is on dirt roads. I think I need to be getting more road running in, since the marathon will be solely on paved surfaces. At Cerise Park in Montrose - 14 mile "long run" completed! On Monday, I finally got around to trying the Rowing machine at the gym! And had sore arms for the rest of the week because of it! I'd like to make it a regular cross training exercise though because I never do anything to workout my arms...and they need it! On Wednesday, I went to "speed work" at the track for the first time since early September. But...I didn't actually do any speed work ;)! I honestly felt fairly tired this week (skipped 2 runs!!) and wasn't really up for it, but wanted to go and catch up with people. And I am glad I went. 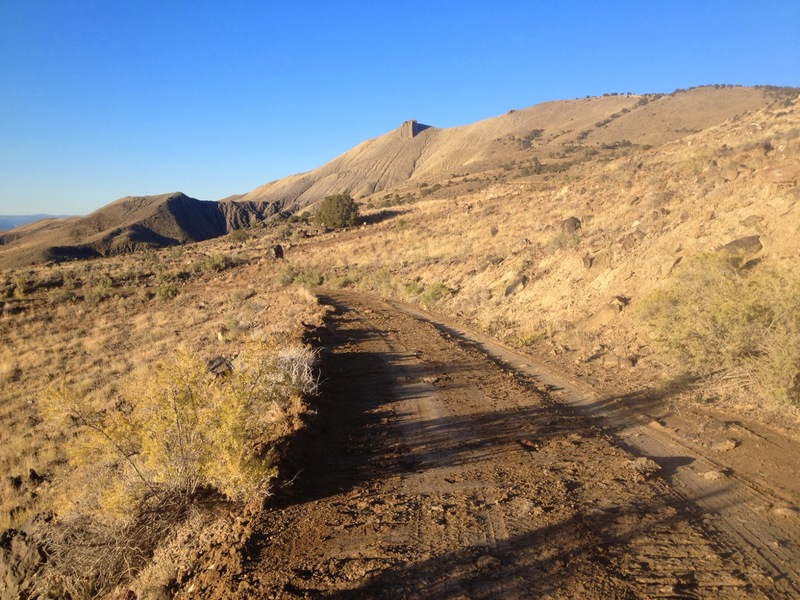 I was able to get a good idea of a route for Sunday's long run (the Black Canyon Triathlon bike route is 15 miles on back roads - that are NOT dirt!) and got invited (or more invited myself) to tag along on a trail run on Saturday. So, as I just briefly mentioned, on Saturday, I tagged along on an 11 mile trail run on a 4-wheel drive road near Devil's Thumb golf course in Delta. I actually really enjoyed this route, and I think it'll be a good one to do in February and early March as training for my 50K. 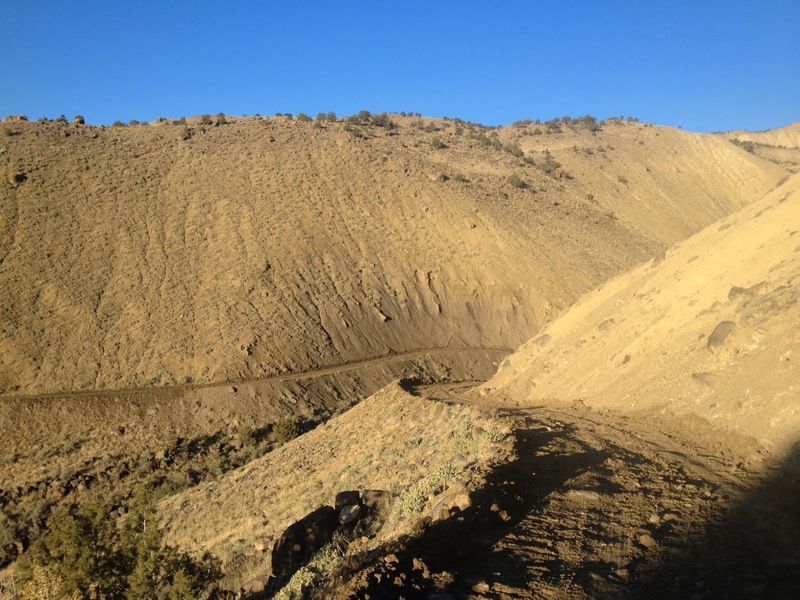 It gradually climbs up towards the mesa (and gets steeper the closer you get). We got a little over 1000 feet of gain in 5.5 miles before turning around. This run felt GREAT. I was really enjoying myself and felt like I could have kept running forever! LOVE this picture. 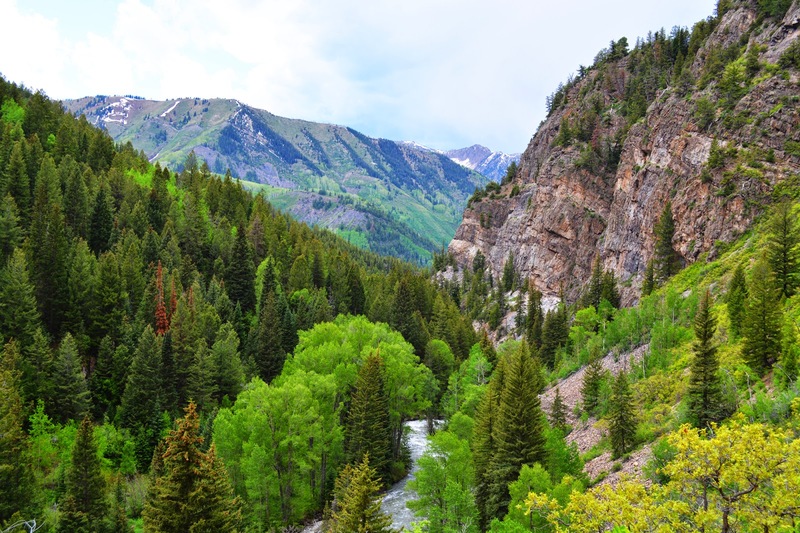 So often I think of the non-mountain areas of the western slope as being kind of ugly, but this shows how it can be beautiful too! Elevation gain - it felt much more gradual than this makes it look! For Sunday's long run, also as briefly mentioned, Scott and I decided to try out the Black Canyon Triathlon bike route. It's a 15 mile course, and we needed to run 15 miles. Perfect solution. 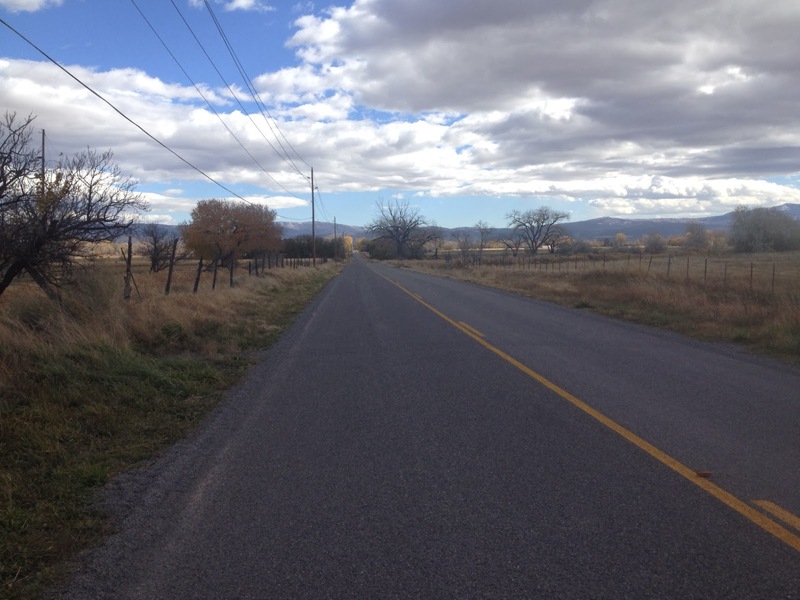 It was on back roads to the northwest part of town, and was all paved (which is good for me to get the practice in of running on such hard surfaces). Not the most exciting route, and was actually a bit hilly, but it was a nice change in scenery and location (plus the hills are good for me, right?). Overall though, this run did NOT feel so great. I don't know if it was because I did such a long run the day before, or because it's the longest run I've done on an all paved surface, but I was ready for this to be done by the time we hit mile 10. It was probably a good thing that we were so far from the car. I pretty much HAD to keep going. It is always weird though how some runs can feel so easy and some can feel so hard. But it's all a good learning experience and I know it's all benefiting me in the long run (no pun intended)! I feel so bad a$$ when I look at this, and how huge of a distance that is compared to Montrose! 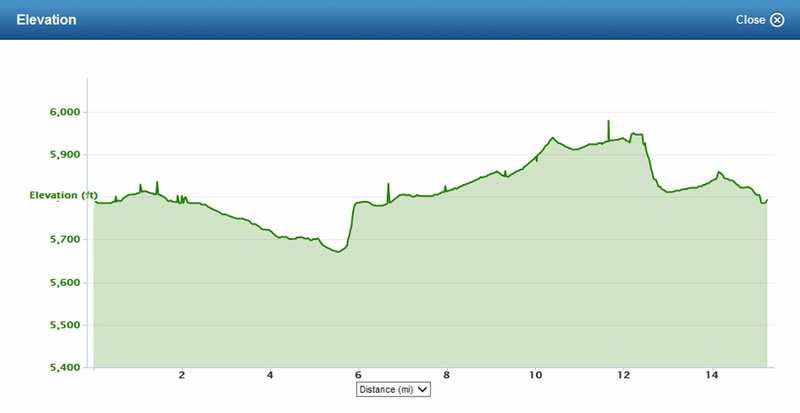 Elevation - it really didn't feel as hilly as this makes it look, except for the hill right around mile 6 - that was ROUGH! And then going down after mile 12 was a steep one too. Views from our route - lots of farmland. I realized that between Saturday and Sunday combined, I actually ran, almost exactly, the distance of a marathon! 11 Miles on Saturday + 15.25 Miles on Sunday! How crazy to think that I will be doing all of that at once! It honestly has me a little intimated for the first time, especially since my 15 miler didn't go so great. But I've still got 9 1/2 weeks of training left and many more long runs! 7ish miles – went to the track and lost count of my laps, so I just ran for about 70 minutes. Again, another friendly reminder that I am dedicating my marathon and training to my grandmother, and as part of that, fundraising for the Alzheimer's Association ALZ Stars. 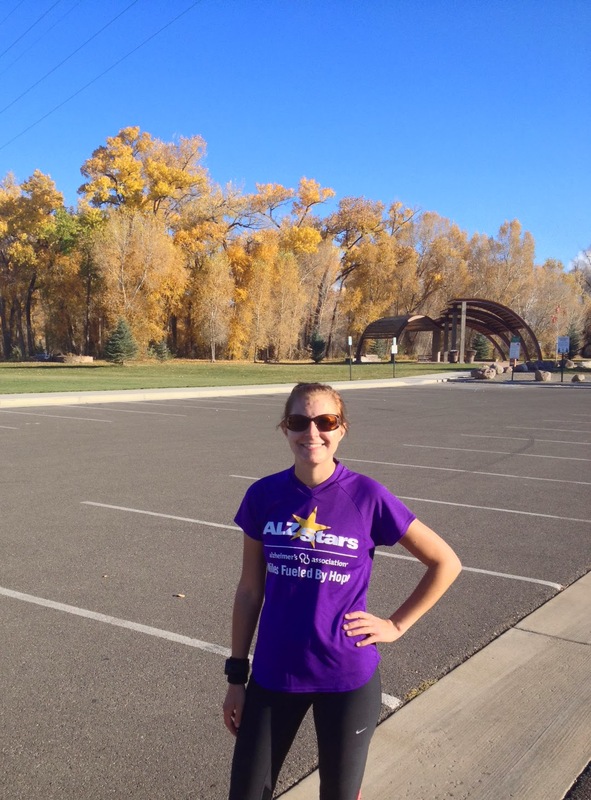 You can donate towards my cause on my ALZ stars website: act.alz.org/goto/kateavery. I received quite a few donations since my last post, so THANK YOU for your generosity! You get some of the prettiest pictures out there! 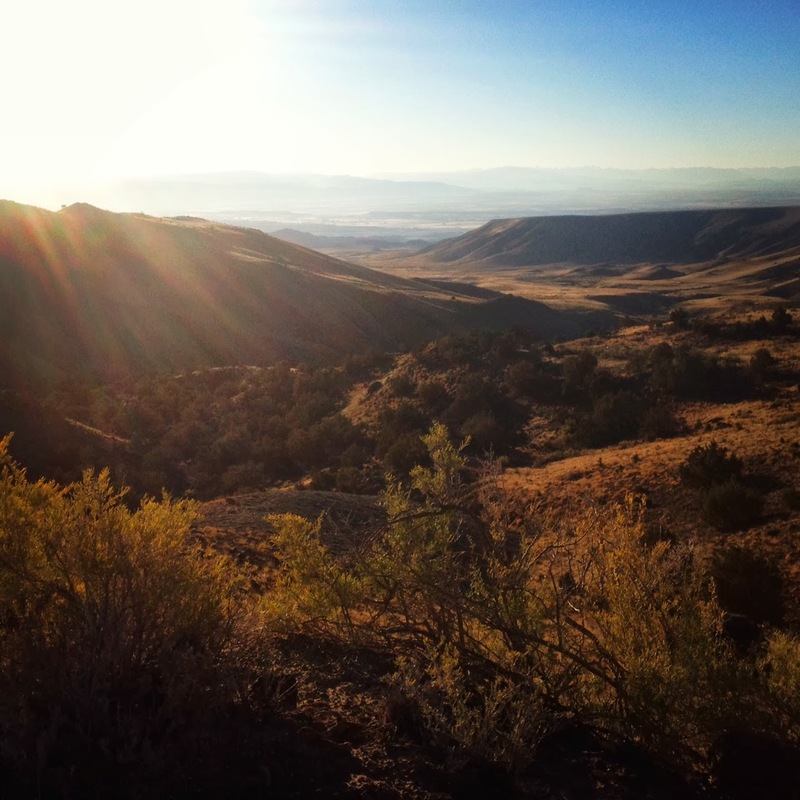 Western Colorado is so lovely in the fall!